CLARITY’S rugged steel hull and elegant lines can accomplish many goals; exploring exotic locations with family and friends, or entertaining large groups with class and style. A unique yacht to meet unique needs. West Florida Yachts would love to guide you through a personal showing of this 144' Bilgin Classic 2015. 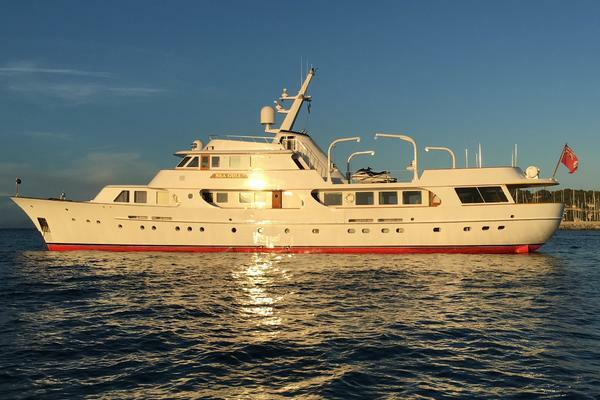 This yacht for sale is located in Fort Lauderdale, Florida and priced at $12,200,000. For a showing please contact us by filling out the form on this page and we will get back to you shortly! A modern classic, in the spirit of NERO, SYCARA IV, and VAJOLIROJA; CLARITY is a gentleman’s yacht inspired by the glamorous aesthetics of the ‘Roaring Twenties,’ with all the modern conveniences one expects from a yacht of this caliber. CLARITY is designed to explore and entertain with class. Turn on the Zero Speed stabilizers, drop one of the 300kg stainless steel anchors in an exotic bay, and walk on to your bridge deck lounge while taking in the primitive scenery on a proper yacht. Board the tender with ease by walking down the side stairs to the sea level platform where an excursion to untouched beaches awaits. Her classic exterior styling is echoed by an interior that is timeless and luxurious, yet livable. 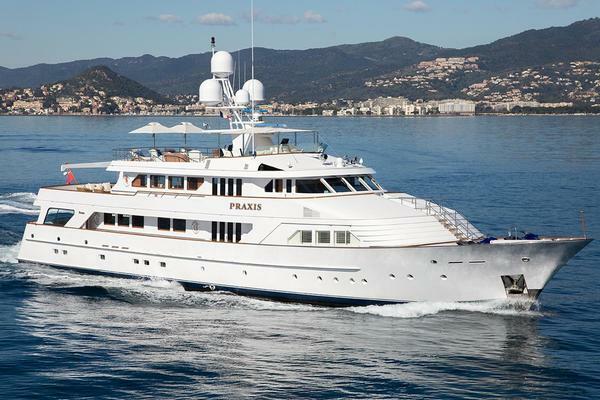 She accommodates 10 guests in 5 staterooms, including an enormous on‐deck Master Suite. The Guest Staterooms are exceptionally spacious for a yacht of a comparable size. The King VIP could easily serve as a second master. Neutral finishes and loose furniture allows new owners to add personal touches and accent colors with ease. 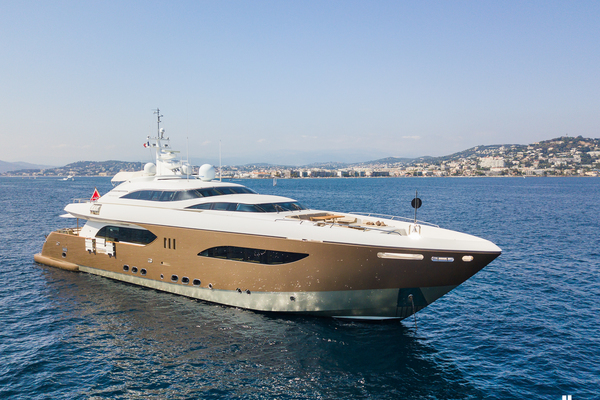 One the most notable things about CLARITY is her interior volume and exterior spaciousness. There is enough space to comfortably entertain and to truly get away. The outdoor shaded entertaining areas are particularly large on several teak‐decked areas, including a back‐lit mahogany bar, dining accommodations, and oversize sun beds. The Main Salon and Skylounge entryway doors completely disappear into the bulkheads, marrying interior with exterior to create two seamless open spaces on the main and upper decks, where picturesque views of the sea complimented by layered lighting make for a humbling and serene backdrop. Thoughtful exterior observation areas provide refuge from entertaining or a quick getaway for a private phone call. Day heads on all decks make big soirees much easier for guests and crew. Her walk‐around side decks on every level provide easy and safe access for young and elderly guests to travel fore and aft. Upon entering the Main Salon, family and friends are welcomed with comfort and luxury. An easy, sophisticated style makes for a relaxed atmosphere, as light pours in through large windows, highlighting the yacht’s beautiful joinery and millwork. An inviting sofa and stately arm chairs surround a large tufted ottoman, providing storage, extra seating or a place to enjoy your afternoon snack. Sumptuous carpeting throughout completes the feeling of being encompassed in elegance. The Salon flows nicely into the formal dining experience forward. An oval‐shaped Mahogany table seats 10. A natural agate stone panel and warm back lighting transforms the bulkhead behind into a romantic backdrop. The main deck day head and exterior door are just off the starboard side of the dining area. The agate is repeated as top panels on the two entryway consoles. The bi‐level Master Suite is located on the main deck with a centerline King berth, spacious walk‐in closet, and office space with a desk. A panoramic view through large forward and side facing windows offers the best experience on board. Forward of the bed is a staircase leading to the palatial bathroom done entirely in marble with His & Hers sinks and a large zero threshold shower. The master also outfitted with a small refrigerator, and white and red wine coolers holding 98 bottles total. The lower deck layout consists of four staterooms with ensuite heads. Forward is a full‐beam VIP outfitted with a King berth and His & Hers vanity, two doubles, and one twin. On the Aft Deck, a large oval dining table provides covered al fresco dining for 10. A few steps aft is the teak observation deck overlooking the water, a unique and exclusive pleasure to experience. The yacht has a classic fantail stern with hydraulic gangway for Mediterranean‐style docking. Entry doors to the Salon are framed in high polished teak and have the ability to slide completely into the side bulwarks, transforming the Aft Deck and Salon into one huge entertaining space. The Bridge Deck is perfect for al fresco entertaining, as well as outdoor privacy. The stunning full‐size bar seats up to seven. It features a natural agate stone bar top illuminated by LED under lighting, akin to the bulkhead panel in the formal dining area. A 5’ long commercial size slide‐top cooler ensures ample storage for plenty of cold drinks. The aft portion of the bridge deck is one huge sun bed. Spanning the width of the deck, it is large enough for eight guests to soak up the sun. A Sunshade tastefully covers most of the seating area for all day fun. Well‐suited for a proper gentleman’s card game or a family movie night, the Skylounge exudes casual sophistication. An oversize love seat and arm chairs are positioned around a French steamer trunk coffee table. Fine joinery showcases a large TV, viewable from the bridge deck bar with synched speakers if desired. Exterior entry doors are framed in high‐polished teak, and like the Main Salon doors, they have the ability to slide completely into the side bulwarks for a second harmonious entertaining space on the upper deck. Forward of the Command Bridge is the Portuguese Bridge outfitted with two large sunbeds doubling as two Bosun’s lockers with freezers. Around the mast is additional cushioned seating. This exclusive space is perfect for an intimate conversation or privacy when Med‐style docking is required. Accessed from the Bridge Deck via a teak and stainless staircase, the Top Deck is the most private outdoor area with the best view. This generous space is home to five chaise sun lounges, and has all teak decking surrounded by stainless handrails and stanchions. The crew’s quarters are accessed through the galley or the lower guest corridor via a hidden door in the yacht’s paneling that you might not see unless you know it’s there. In this lower crew area are the crew cabins, all with ensuite heads, the crew mess, and laundry center. The captain’s cabin is located behind the bridge and outfitted with a double berth, ensuite head, desk, and ships’ monitors. and Skylounge. Captain and Crew lounge have TVs and DVD players. Bilgin yachts is a fifth-generation shipyard business with a 100-year history of marine-grade stainless steel fabrication, building materials, and furnishings. Now operating four facilities, Bilgin builds completely custom contemporary and traditional motoryachts up to 80 meters in length. Master craftsmen are capable of simultaneously building four 45-meter yachts at their 7,000 square-meter facility in Istanbul. CLARITY is hull no. 2 of the retro 1920’s traditional motoryachts, a timeless design that will never go out of style. Solid steel construction and bulletproof windows are built to withstand heavy seas on a self-sufficient yacht with a 1,700 gallons-per-day watermaker, internationally compliant sewage treatment system, and enormous provision freezing capacity. The yacht is a pleasure for crew run, with a Captain’s cabin steps from the helm and crew lounge access from the galley and lower deck guest foyer. The engineer has a large and spacious engine room with easy access to pumps and motors. A long range, steel hull, efficient motors, redundant systems, elegant interior, extensive storage capacity, large berths, and a safe & modern yacht unique in design, make CLARITY perfect for private use, as well as charter capable.